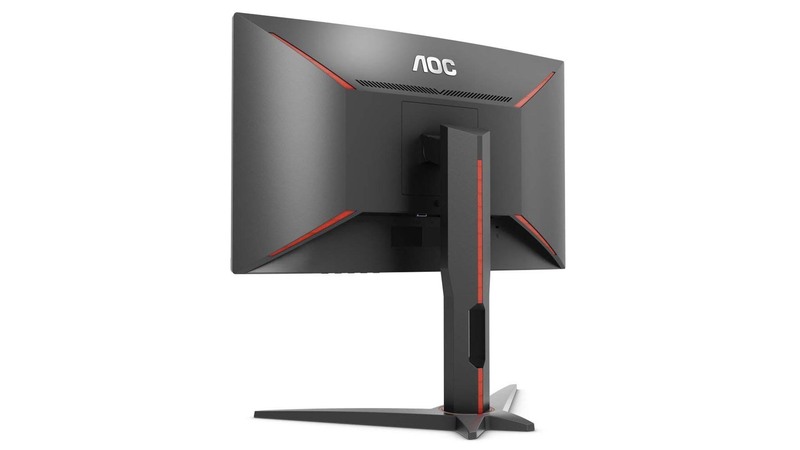 AOC is at it again with the C27G1: a curved 27-inch VA monitor capable of hitting that all-important 144Hz refresh rate. AOC is targeting the triple monitor crowd with the G1’s moderate curves and bezel-less frame, but even flying solo this speedy panel delivers for 1080p, high refresh rate PC gaming. Starting out, AOC has brought its A-game again with the overall quality of the G1. The stand offers tilt, swivel, and height adjustment, and takes up pretty minimal desk space. And while there’s no RGB lighting in sight, the panel’s aesthetic is a healthy blend of gamer-red highlighting and smart AOC styling. And with a gentle, 1800R curve and bezel-less design, the G1 is plenty agreeable for a double, or triple-screen, setup. And a generous one at that. If you demand reasonable real estate, 27-inch is about the minimal distance across the diagonal that you’ll settle for. The G1 hits that requirement, and could make for an immersive rig assuming you’re prepared to partake in one or two more. At $280 (£248) a piece, however, that’s a mighty investment. Where the panel falls a little short is on the resolution. 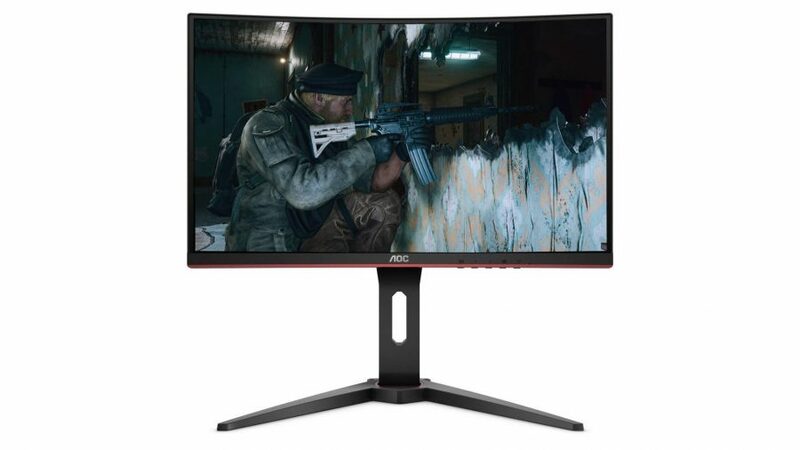 Its 1920 x 1080 resolution is fine for gaming if you want to hit that 144Hz refresh rate using a mainstream GPU, but that space can feel a little confined for productivity. The double or triple threat may make up for that, but going solo that resolution might feel cramped quick. But even a lone monitor isn’t going to let you down in-game. The G1’s VA panel offers remarkable contrast, and doesn’t bottom out on the black level either. All around the panel performs admirably. White saturation is up to spec, and there’s no banding to be seen either. Viewing angles are also superb. Though the monitor does slip a little when it comes to overall brightness, however. Fully-geared up in the OSD for rapid-pace gaming, the monitor does fall short on peak luminance. It’s rated to a spec of 250cd/m2, fine for a dark room or gamers that care for their eyes, but if you don’t give two hoots for ocular austerity then you might want to look elsewhere for something more capable of searing retinas. Ports-wise the G1 has a fairly minimal selection, too. Without a USB hub the rear panel is a little desolate, but the usual suspects are present, including: VGA, DisplayPort 1.2, dual HDMI 1.4 connectors, and a 3.5mm single headphone output. The C27G1 was whisked away from our office before the Nvidia Adaptive Sync-inducing driver update was released, so unfortunately I never had the chance to see if this particular FreeSync model was conducive to Nvidia G-Sync standards. The AOC C27G1 does have a FreeSync range of 48Hz – 144Hz so it should stand up pretty well when it comes to pairing the adaptive sync tech with an Nvidia GPU. We’ve tested other FreeSync screens with the same range and they work brilliantly. For the record, here’s how to give FreeSync a whirl on Nvidia 10-series, and above, graphics cards. In a move without precedent, Nvidia has decided to go with the tides and accept the adaptive sync technology. With driver support just rolling out, a whole heap of FreeSync monitors are now compatibility with overwhelming majority of gamer’s rigs. But there are limitations, Freesync compatibility can occasionally fall short of G-Sync’s spec resulting in some unwanted behaviour. In the end, if you really want rapid-fire performance for seriously competitive gaming, you’re maybe better off buying a cheaper TN panel. They don’t have the same vibrancy or image clarity, but you’ll get faster response times, higher refresh rates, and greater levels of brightness for less cash. But if you aren’t going pro, and, let’s be honest, most of us are already way past it, the G1 offers a great balance between contrast, quality, and speed. It may not be the brightest or the fastest, but for most gamers the curved C27G1 strikes a great balance between speed, quality, and design.